Early in Jesus’ ministry great crowds would gather to hear Him speak. People were drawn by what He said and the miraculous healings He performed. Jesus traveled all over the area called the Galilee, which was the northern coast of the Sea of Galilee and stretching west almost to the Mediterranean Sea. Several of those called to be His disciples were from the area of Galilee. Scripture tells us that Jesus gained a strong following and that often crowds of people would seek out where He was to hear Him speak and see Him perform miracles. ~ You are blessed when you are persecuted & you should rejoice. ~ Anger against another person is like murder. ~ When evil is done against you, turn the other cheek and allow it. ~ Love those who are your enemies and pray for your persecutors. ~ Give to the needy but don’t tell others about it. ~ Pray in secret and you will be rewarded. ~ Layup treasures in heaven, not on earth. ~ Don’t be anxious for food and clothing. And much more. But I think you get the idea. It was like Jesus was taking the way we normally live our lives and inverting it, turning it upside down. He is telling us what kingdom living is all about. I would like to begin a series of messages on the Sermon on the Mount. This sermon that Jesus gave is a message given to His disciples and a crowd of people on a hillside overlooking the Sea of Galilee. Matthew’s Gospel records this sermon for us in Matthew chapters 5-7. 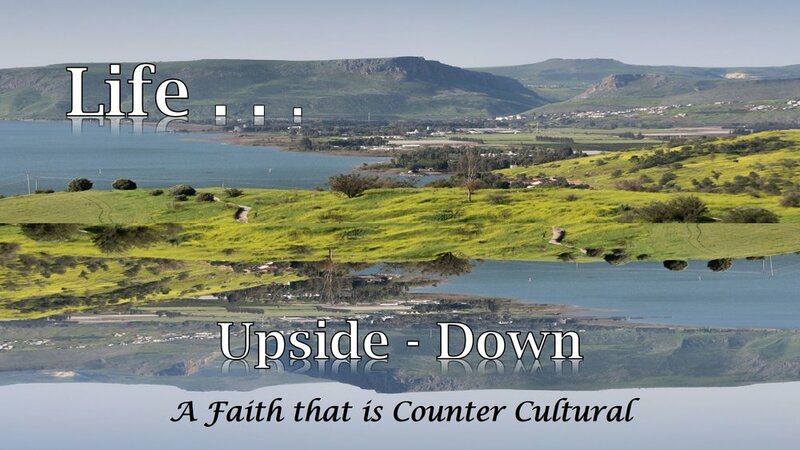 In this sermon, this Jesus taught His disciples and the crowd the upside-down life of Kingdom living. The Kingdom certainly does have a future, not yet experienced, understanding about it. However, we need to keep in mind that, according to Jesus, the Kingdom of God was present and powerful in its work in the hearts of mankind even during His time. He used the terms “Kingdom of God” and “Kingdom of Heaven” interchangeably (Matthew 19). As Jesus speaks to the rich young ruler Jesus refers to salvation as entering the Kingdom of Heaven now. Those who are saved are kingdom citizens and as such we bring God’s kingdom into the everyday aspects of our lives. Often, we hear about a millennial kingdom that will take place after the Tribulation period. Though there is a future kingdom when Christ will rule with a rod of iron and justice will be a common experience, there is a kingdom right here and right now that is present in the heart and life of every believer. As we submit our hearts to the King of heaven, we are a part of His kingdom. So, we could say that where ever the reign of Christ is being manifest, the kingdom of God is there. Ray Vander Laan expresses it this way. The kingdom takes place “where ever God is kinging” or wherever He is reigning. As people submit to God as their King, the King of their lives, God’s kingdom is established and experienced right there in that person’s life. Thus, as we look at the Sermon on the Mount over the next few weeks, we are talking about what it looks like in our lives when we allow Christ to be the King in our lives. Why should we be concerned with living like this? Can’t we just be normal? 1 Thessalonians chapter 4 talks about the day when the church will be raptured, and we will meet Him in the air. Then in chapter 5, we are told that in the mean time we should not live as children of the darkness, but as children of the day (1 Thess. 5:4-6). In other words, as born-again believers, we are citizens of heaven, we may still live on earth, but we should live like citizens of Heaven with Jesus kinging in our lives. Recently, I read that “When evangelist Vance Havner was advanced in age, his wife died. His grief and loneliness overwhelmed him, but he determined to persevere in his work with an increased longing for heaven. He wrote, ‘I once read of a man who lived beside a river but had little interest in the people on the other side until his daughter moved over there to live. I have lived beside the river many years, but this past year has heightened a thousand-fold my concern about the other side’” (Hope Thou in God). In that devotional I was reading, it said that “Every passing day brings us closer to heaven and closer to our loved ones who have preceded us, and one day soon we’ll have the reunion of the ages to enjoy. But until then, we must press on with cheerful faithfulness, walking and working as children of the day” as it says in 1 Thessalonians 5 (David Jeremiah). Every day we should strive to live like a kingdom citizen, live like who we are in Christ. Learn about the other side of the river of death and learn to live like citizens of that kingdom. This looks upside down to our world today. It is like we live on the one side of this great divide between us and Heaven, that transition we take in death, but we live like we are already on the other side. That is Kingdom living. As you may remember, we did a series of messages on the Beatitudes back in October and November. If you missed any of those messages, you can hear them and/or read them on our website. But when we were going through each of the Beatitudes in Matthew 5:1-12, I really began to understand the importance of Kingdom living and that is what Jesus is talking in the Sermon on the Mount in its entirety. It is not about what we will be like in the future, though it will look like that, but it is about what we should be today as we live for the King. The Beatitudes are the dispositions of a Kingdom citizen, simply put, anyone who is saved. Can I remind you of the eight Beatitudes we talked about? This means that we are emptied of self and we are begging God to fill us. It is a removal of pride and seeing ourselves as destitute without Christ and totally dependent upon God. This is a grief, sadness, or sorrow over sin in our lives. It is the picture of repentance. Meekness is having great power, but it is under control. There is supreme bliss for the kingdom citizen when meekness is a developing disposition in their lives. Divine joy is available for the person who feeds on God’s Word and nourishes their spirit with the nutrients of God’s wisdom. When we withhold the bad that someone deserves to get, there is joy. Purity of heart is what motivates you to do the things you do. How you process your thoughts about something. How your desires and rationale align with God’s will for you. Purity of heart means you put one thing above everything else in your life. Your love and your relationship with the Lord becomes preeminent. As ambassadors of God’s peace, being a witness and testimony of what real peace looks like, or as reconcilers for peace with God we mediate peace attempting to draw others to God’s peace. There is happiness in this. Do we have the right perspective when it comes to persecution and reviling; people saying evil things against us? Do we avoid it at all costs, or take joy in sharing in His sufferings? Do we keep quiet or compromise what we believe to keep from offending others, or do we find joy in standing for our Jesus no matter what others say or do? These are the attitudes or dispositions of a Kingdom Citizen. Not that they are perfected in our lives as of yet, but every day our pursuit is to live like we are already on the other side of the river, living with our Savior in glory and the reason for this we concluded is found in verses 13-16. Why do we live like this? The effect or influence we have in this world. As we live with the disposition or attitude of the Kingdom, we have and impact like that of salt and light. Just light salt and light impacts our life on earth, so we should impact those around us. Like salt and light we are to come in contact with others, be different than others, revealing areas of wickedness and dispelling darkness. You see, everything Jesus has just talked about concerning living as a Kingdom Citizen in the eight Beatitudes is about being salt and light. The way we live our lives each day is either penetrating salt, brilliant light, or it is salt without saltiness and light under a basket. I guess the point we are making here is that Jesus says our lives should begin to look radically different from the world around us. These first 16 verses of Matthew 5 are only the beginning of Jesus’ teaching that we should be living in such a way that it seems upside down in our world today. But why? It is so much easier to just go along with the crowd and not cause any waves in our relationships other people, isn’t it? The old adage that “you’ve got to go along with the crowd to get along” is not our goal. We should be different because God did a miraculous change in our lives. In fact, it is a radical transformation. The one who has experienced salvation through faith in Jesus Christ is part of a new creation or the act of bringing something new into existence. In fact, Rabbis of the Old Testament liked to refer to people whose sins are forgiven as “new creatures” which is why the King James uses that word in its translation. The idea is that there is a radical transformation that takes place. The old has passed away, is an aorist perfective verb indicating finality! The new has come, is an active perfective showing a continuing state. The past sins of life are forgiven with finality and we are in a continuing state of becoming a new person in Christ. Hallelujah! Here is another verse that talks about that. When we put our trust in our Lord and Savior, we become spiritual participants in His crucifixion and victory over sin. The part of us that lives for the pleasure of sin, dies, but the life of Christ now lives through us. Our life is characterized by our faith in Jesus Christ. There is radical change that takes place with our desires and motives. We are told in Romans 6 that we not only identify our lives with the death of Christ for sin, but our lives should characterize the resurrection of Christ in that we life our lives in a new way. Like Jesus was raised to a new life, we also should experience a new way of living with Christ as our Savior. Even my favorite verses for sharing salvation, in Ephesians 2 speak of our lives as a new creation for His good works. There are so many verses we can go to in the New Testament that speak of this radical transformation that takes place in our lives. But let’s read just one more. Put off the old self. Why? Carl Barth would say, because “every trait of the old man’s behavior is putrid, crumbling, or inflated like rotting cadavers.” The old self that belongs to our former life before salvation needs to be put off, once and for all. We need to put on the new self, created after the likeness of God in true righteousness and holiness. These terms are often used in the sense of putting off and putting on a garment. It is like a new change of clothes. Things are different in our lives and the new garments are reflective of that change. So many passages speak of the change that takes place in our lives when we become children of the King, when we put our faith and trust in Jesus Christ as our Lord and Savior. Why are these verses important when it comes to a study on the Sermon on the Mount? Because what Jesus tells us from that hillside in His sermon is radical and it will look like life turned upside down. He characterizes for us a faith that is counter cultural. In other words, it is different from all we think should be normal in our lives. This morning my desire was just to do a bit of review and prepare us for this study on the Sermon on the Mount. Some of the things Jesus says will look upside down, inside out, inverted, and backwards to what we think it should be. But the reason for that is that we are talking about citizens of the kingdom, becoming new creations, putting off the old and putting on the new. We are talking about radical transformation. I have talked to many people who say they are Christians, but when you look at their lives, there is no evidence of anything different in their lives. There is no evidence of even an attempt to see change in their lives. Change happens only when Christ becomes our life. Genuine salvation changes our desires and our motivations for living. Jesus does a recreating work in our hearts and if there is none of that, then I don’t believe there is salvation. If you say you are saved today and there has never been any radical transformations taking place, what is your faith and trust in? Why are you still the same person? Jesus tells us that we will become new creations in Him as He live through our lives. Even when I first trusted Christ as my Lord and Savior at 11 years of age, there were some things that began to change and some that did not. Through my teenage years, it may have been hard to see much transformation taking place, but there was some. But when I laid it all out and let Christ transform me at about 24 years of age, things really began to change. The old was being put off and the new was being put on. Where are you in your walk with the Lord. Are things different now than they ever used to be? We should be continually growing in our walk with the Lord. Are you? Do you know Him as your Lord and Savior? As we see some of the things Jesus has to say about anger, lust, divorce, our enemies, our treasures, and our prayer life, my prayer is that as our Lord speaks to your heart, that you will be open to the change He desires in you.